You reached Something really worth Having, the fanlisting dedicated to Hyakuya Yuichiro, one of the characters of the series Owari no Seraph (Seraph of the End)! 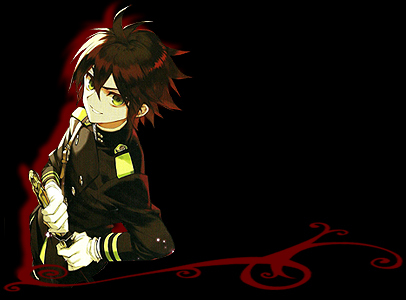 Yuichiro is the second character I like the most of this series. I fought a lot with myself in order to chose between him and Guren, and even if I still prefer the second one, I can't help myself to adore Yuichiro with all my heart. His past was the thing I saw at first, a devastating, difficult and suffered past that led him to become stronger and more determinated with his life. The thing he loves the most is the family and he took a lot to understand that after that his first one was killed almost entirely, he could be part of another marvelous one... new, but still full of people that love him. Well, well, as I usually write XD I'm in love with his personality since he's quick-tempered as the characters I like the most. He's sweet, tsundere and aggressive at times, but I really adore every little shade of his personality... especially his love for friends and family. Owari no Seraph (Seraph of the End) and related characters are property of Yamamoto Yamato, Takaya Kagami and Shueisha. Layout and contents are ©Miriallia do not steal or reproduce~ All the images I used are from Google.com, if you think they belong to you, just drop me an email, I will credit you~!